La Marina d'Alèria invites you to spend a memorable camping holiday in the stunning island of Corsica. This four-star campsite has an unrivalled location on the eastern coast of the island and boasts every amenity you may possibly need for a luxurious stay between the sea and the mountains. The LUX-Camp team can help you plan a special camping holiday in Corsica. Get in touch today and get ready for a luxurious break in this gorgeous island. 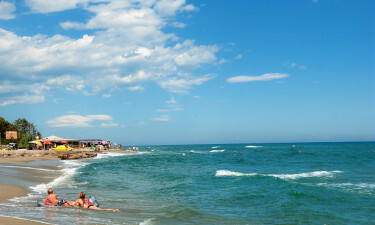 Why should I camp at La Marina d'Alèria? 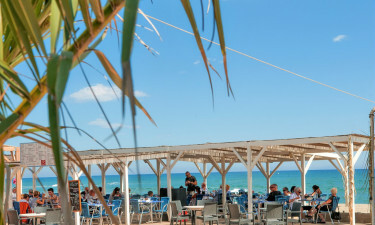 La Marina d'Alèria is a Yukadi Village campsite created with comfort and luxury in mind and known for its high-quality environment and convivial atmosphere. A serene natural environment that offers opportunities for relaxation as well as fun days out with your family or friends. 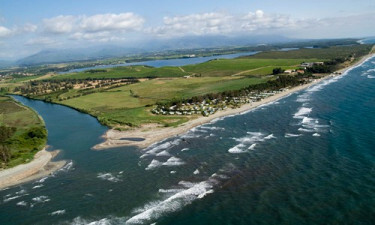 Balmy and sunny weather between for nearly 8 months of the year – The ideal climate for a camping holiday. Stay at this luxury camping site and choose among more than 10 types of cottages, bungalows, and mobile homes, which have been designed and equipped to make you feel at home. Quality accommodation is one of the key differences between an average camping holiday and a first-class camping experience. Marina d'Alèria will not disappoint you if you are after variety of choice and superb accommodation standards. There are more than 10 specialty accommodation options to choose from, including wooden 1-bedroom chalets and deluxe 2 and 3-bedroom mobile homes located steps away from a white sand beach. All plots are beautifully landscaped and surrounded by fragrant pines, eucalyptus trees, and colourful flowers. Luxury camping doesn't get any better than this! Relax: you are in the perfect place for it! Camping Marina d'Alèria is perfectly equipped to help you relax and unwind during your well-deserved holiday. Regain balance and recharge your batteries at the wellness centre, enjoy long walks on the powdery sand beach, or relax by the poolside with a good book. Camping Marina d'Alèria is ideally situated in eastern Corsica, a fascinating region that is home to unspoilt coastal and rural landscapes and to charming traditional villages. Recommended day trips include the ancient ruins of Aleria (one of Corsica's top heritage sites), the impressive San Gavino waterfall, the medieval villages in Ghisoni, and the exceptional beaches in Costa Serena and the Coast of Pearls. Guests at Marina d'Alèria can enjoy the finest Corsican cuisine without leaving the campsite's premises. An on-site restaurant serves local specialties, antipasti, and delicious pizzas in a sophisticated but friendly atmosphere. Cocktails, soft drinks, and specialty tea and coffee are served at Marina d'Alèria's on-site bar. For all your groceries, freshly baked goods, and holiday essentials, simply head to the campsite's supermarket. Convenience stores and other grocery shops are a 5-minute drive away in Aleria, where you will also find souvenir shops and farms selling locally grown goodies.